Before taking a Companion Air flight with your pet, have your veterinarian examine the animal within 10 days of transport to ensure that it is healthy enough to make the trip and have them issue a health certificate. Ask your veterinarian to provide any required vaccinations or treatments. At Companion Air, we do not recommend the administration of tranquilizers, but of course you should follow the advice of your veterinarian. If you do administer tranquilizers as prescribed by your veterinarian, follow their directions carefully and administer only in the prescribed dosage. 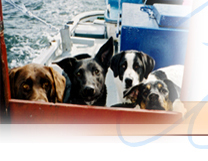 Here at Companion Air the safety of our pet friends and our crews is our first concern. Please be sure to arrive with an adequate kennel (or reserve one of ours for a nominal fee). If wheels are installed as part of a kennel, they have to be removable or must be able to be rendered inoperable prior to transport. We don't want kennels rolling around the cabins. If in our judgment your animal poses a danger to other pets or our crews, we reserve the right to refuse transportation. In that case, we will of course refund your fares. Along with your e-ticket, you will receive direction to the local airport (many times this will be your community airport), feeding & watering instructions, and if time permits, identification tags for your pet and one for the kennel. Be sure to bring this information with you to the airport and plan to arrive at least 15 minutes prior to departure time so we can board leisurely and make sure everyone is safe and comfortable. Stress free travel for pets and owners is our mission. If your pet has any special needs, care or considerations, please be sure to write on both the pet and kennel tags. Dogs and cats must be at least 8 weeks old and must have been weaned before traveling on Companion Air. Kennels must meet minimum standards for size, strength, sanitation, and ventilation. The following are guidelines from the USDA. They are simply intended to provide a safe humane environment for your pet. In some cases, we have added specific instructions for Companion Air travel which are shown in bold. Size and Strength -- Kennels must be enclosed and allow room for the animal to stand, sit, and lie in a natural position. They must be easy to open, strong enough to withstand the normal rigors of transportation, and free of objects that could injure the animal. Sanitation -- Kennels must have a solid, leakproof floor that is covered with litter or absorbent lining. Wire or other ventilated subfloors are generally allowed; pegboard flooring is prohibited. These requirements provide the maximum cleanliness for the animal in travel. Ventilation -- Kennels must be well ventilated with openings that make up at least 14 percent of the total wall space. At least one-third of the openings must be located in the top half of the kennel. Kennels also must have rims to prevent ventilation openings from being blocked by other cargo. No cargo here! However, rims are useful to ensure clearance from any other objects that may block ventilation. These rims--usually placed on the sides of the kennel--must provide at least three-quarters of an inch clearance. Grips and Markings -- Kennels must have grips or handles for lifting to prevent personnel from having to place their fingers inside the kennel and risk being bitten. Kennels also must be marked "live animals" or "wild animals" on the top and one side with directional arrows indicating proper position of the kennel. Lettering must be at least 1 inch high. Animals per Kennel -- Each species must have its own kennel with the exception of compatible cats and dogs of similar size. Maximum numbers include 2 puppies or kittens under 6 months old and 20 pounds each and of similar size, 15 guinea pigs or rabbits, and 50 hamsters. Airlines may have more restrictive requirements, such as allowing only one adult animal per kennel. Be sure to check with the airline you are using. At Companion Air, each animal must be in their own kennel. If some unusual circumstance should ever require diversion or delay, we will follow the instructions you provided on the "feeding and watering form you provided". This form is not required if you are traveling with your pet. Of course we would contact you to let you know of the delay if you aren't aboard. We have treats aboard our special aircraft so also please include instruction on whether or not your pet is allowed to have these light treats. Treats are distributed upon landing to prevent any in-flight difficulties for our animal travelers. These are generally small and nutritious, all natural, and a special part of their experience. Be sure to offer your pet food and water within 4 hours of transport, and document the feeding time and date on the feeding instruction form. As far in advance of the trip as possible, let your pet get to know the kennel by leaving it open in the house with an old sock or other familiar object in it. Arrive at the airport with plenty of time (while airlines require at least an hour ahead of time, at Companion Air we recommend at least 15 minutes early). If your pet is traveling alone, they should not arrive at the airport more than 1 hour prior to departure and must be picked up upon arrival. If you have scheduling conflicts on either departure or arrival, we can provide a list of local transporters and kennels to assist. We recommend that you travel on the same flight with your pet whenever possible. The experience for both you and your pet will be so much more enjoyable. Be sure to carry a leash with you so that you may walk your pet before check-in and upon arrival. Do not place the leash inside the kennel or attach it to the outside of the kennel. Please be considerate of other travelers at your local airport. Please keep your pet under control and if your pet becomes noisy or agitated, please move them to an area where they won't disturb others. At our facilities, everyone is involved in pet travel and we love the various pet personalities we encounter but at general aviation airport facilities, there are travelers using the terminals for many reasons. Some terminals do not allow animals inside the terminal buildings so we will ensure alternate access to our aircraft parking area. While we love our pets, others may be allergic or fearful so your considerations will ensure that we are welcome to provide these services at airports across America in the future. Outfit your pet with a sturdy collar and two identification tags. The tags should have both your permanent address and telephone number and an address and telephone number where you can be reached while traveling. Be sure that the Companion Air pet and kennel identification tags are legible and secure. Make sure your pet's nails have been recently clipped to prevent them from hooking onto the carrier door or other openings.